Tree about 48" in diameter, and planted over 100 years ago was across Bankhead Street as of 9:00 PM. 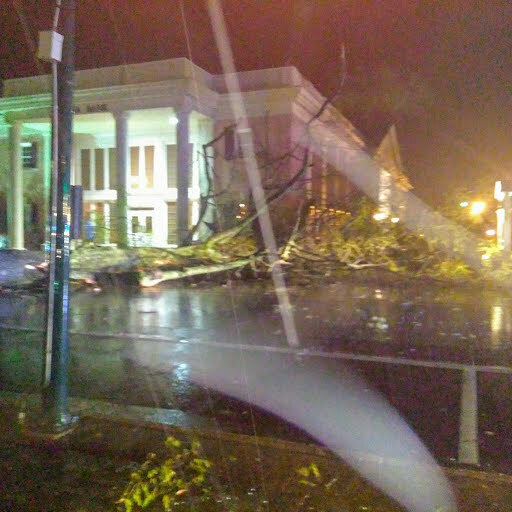 A fast-moving storm struck New Albany about 8:30 p.m. Tuesday night causing widespread damage and leaving many residents without electrical service. BNA Bank appeared undamaged by fallen Courthouse oak tree. 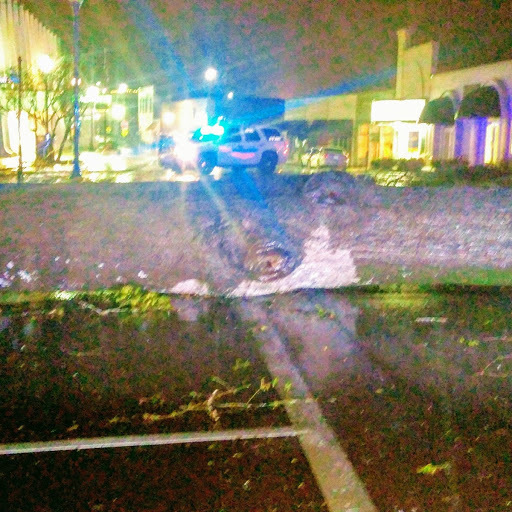 An oak tree, about four feet in diameter, was uprooted at the north edge of the county courthouse lawn and completely blocked Bankhead Street. Several other large oaks at the courthouse were damaged. The trees were planted about the time the courthouse was completed in 1909. Besides the oak that was uprooted blocking Bankhead Street, limbs two feet in diameter were broken from at least two other century old oak trees. There did not appear there was any actual damage to the courthouse building from the Tuesday night storm. The tree blocking Bankhead extended almost to the main BNA Bank building across the street but a quick look did not reveal any damage to the structure. The NALGW manager said at least one large tree was down near the campus of Northeast Mississippi Community College leaving New Albany’s historic northside neighborhoods without power. NAPD blocks Bankhead St. traffic as 100 year old tree is cleared from roadway. Mattox said at 10 pm that, We’re just now assessing the damage, getting our arms around it.” He said NALGW crews will work throughout the night to clear damage and restore power as soon as possible. More news will be posted on NAnewsweb.com as it becomes available. Thank you for your informative article concerning the severe weather event last night.